Tom and Ellen Bowen (Fred Astaire and Jane Powell) are a brother and sister dance duo invited to perform in London during the same time that Princess Elizabeth and Prince Phillip are to be betrothed —  only to find their own romances that threaten to break up the act! Royal Wedding has a fairly basic plot —  dancing stars Tom and Ellen Bowen (played by Fred Astaire and Jane Powell), who are going to England to perform their popular Broadway show there. Both have been unlucky in love, and are confirmed bachelor and bachelorette. This begins changing on their boat trip across the Atlantic, as Ellen/Jane Powell begins falling in love with an Englishman, Lord John Brindale (played by a young Peter Lawford). Once they arrive, Tom/Fred Astaire starts to fall in love with Anne Ashmond (played by Sarah Churchill), one of the English dancers in the show. There are various moments delaying the inevitable, such as trying to reunite Sarah’s separated parents, rehearsing with their English cast, etc. but the requisite romances happen pretty much on schedule, with the Royal Wedding of the title (referring to the marriage of England’s then-Princess Elizabeth) happening on cue — with two more soon to follow? I enjoyed Royal Wedding very much, and if you’re a fan of musical romances in general, or Fred Astaire in particular, you will too. Tom Bowen (Fred Astaire): Mr. Hillard can keep his air conditioning —  where he’s going, he’s going to need it! Chester: Have you ever considered getting married, sir? Tom Bowen (Fred Astaire): I was engaged once. Tom Bowen (Fred Astaire): The girl changed her mind at the last minute. I’ve been deeply indebted to her ever since. Chester: Marriages are very healthy, sir. You see, married men live much longer than bachelors. Tom Bowen (Fred Astaire): If that’s true, they’re only trying to outlive their wives so they can be bachelors again. Lord John Brindale (Peter Lawford): Haven’t you met anybody with a title before? Ellen Bowen (Jane Powell): Only John Lewis. Tom Bowen (Fred Astaire): There’s a fellow that won’t take — yes —  for an answer. Irving Klinger (Keenan Wynn): This is a pretty box of pickles! 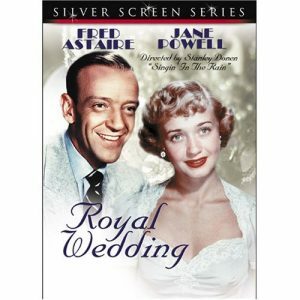 Ellen Bowen (Jane Powell): [referring to the royal couple] I wonder what the bride is doing today. Tom Bowen (Fred Astaire): Why don’t you call her up and ask her? Ellen Bowen (Jane Powell): [chuckles] I wonder what I would be doing a month before my wedding. Tom Bowen (Fred Astaire): Probably trying to find a way out of it. Ellen Bowen (Jane Powell): Do you really think so? Tom Bowen (Fred Astaire): You know you would. Tom Bowen (Fred Astaire): I wonder what the groom is doing today. Ellen Bowen (Jane Powell): Why don’t you call him up and ask him? Tom Bowen (Fred Astaire): Very funny. Tom Bowen (Fred Astaire): Sorry, I thought you were him. Anne Ashmond (Sarah Churchill): How odd. Tom Bowen (Fred Astaire): You should have seen your face when you saw me. Anne Ashmond (Sarah Churchill): How did I look? Tom Bowen (Fred Astaire): As if I were a dentist. Ellen Bowen (Jane Powell): Didn’t your mother never teach you no manners? Tom Bowen (Fred Astaire): I never had no mother. We was too poor. James Ashmond (Albert Sharpe): Do I look like a gentleman? Tom Bowen (Fred Astaire): You look like a banker. James Ashmond (Albert Sharpe): But do I look like a gentleman? June Allyson was first cast in the role of Ellen, but became pregnant. Judy Garland was cast next, but MGM terminated her studio contract. Moira Shearer was considered for the role of Anne. The ship’s rocking during ‘Open Your Eyes’ was based on the Astaires’ own dancing experience on a voyage to London in 1923. A boat-rocking device was used to create the film effect. The idea of dancing with a clothes tree had been suggested to Astaire earlier by Hermes Pan. Retitled ‘Wedding Bells’ in England so as not to make it seem as a documentary of the recent Royal Wedding of Princess Elizabeth, later to become Queen Elizabeth II. After being fired from this film, Judy Garland locked herself in a bathroom and scratched her neck with broken glass. There is much dispute over whether it was a serious suicide attempt or a desperate cry for help. Charles Walters was originally signed to direct the film, but he quit when Judy Garland replaced June Allyson, as he refused to work with Garland again after Summer Stock (1950). Final film of James Finlayson, who has an unbilled bit as a cab driver. Near the end of filming, Jane Powell discovered she was pregnant. This is one of a handful of Metro-Goldwyn-Mayer productions of the 1950-1951 period whose original copyrights were never renewed and are now apparently in Public Domain; for this reason this title is now offered, often in very inferior copies, at bargain prices, by numerous VHS and DVD distributors who do not normally handle copyrighted or Metro-Goldwyn-Mayer material. In an interview given shortly after the film was released, Fred Astaire revealed that he had tried dancing with more than thirty commercially available hat racks before the studio had the prop department design and build the one in the film at a final cost was over $900. The hat rack disappeared shortly after the film wrapped. After being fired from this film, Judy Garland was a guest on Bing Crosby’s radio show, and they sang a duet of “How Could You Believe Me When I Said I Love You When You Know I’ve Been a Liar All My Life”. A recording of the broadcast survives today and reveals the legendary Garland wit. She says she was going to star in this film, but “Leo the Lion bit her”. The singing voice of Keenan Wynn is dubbed by an uncredited vocalist named Bill Reeve. “Lux Radio Theater” broadcast a 60-minute radio adaptation of the movie on April 14, 1952, with Jane Powell reprising her film role. SPOILER: The story was loosely based on the real-life partnership of Fred Astaire and his sister, Adele Astaire. In real life, Adele Astaire married Lord Charles Cavendish, son of the Duke of Devonshire, just as Jane Powell, playing Fred’s sister, marries an English Lord at the end of this film.